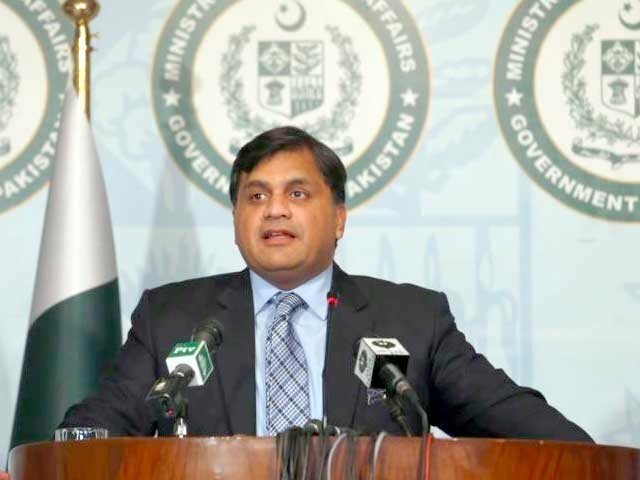 ISLAMABAD: Foreign Ministry spokesman said in opening remarks during the weekly press briefing,that US President Donald Trump, in a letter addressed to Prime Minister Imran Khan stated that his most important regional priority was achieving a negotiated settlement of the Afghan war. In this regard, he sought Pakistan’s support and facilitation. He added that President Trump has also acknowledged that the war had cost both USA and Pakistan. He has emphasized that Pakistan and USA should explore opportunities to work together and renew partnership. Since Pakistan has always advocated a political settlement to end war in Afghanistan, US decision is welcomed. Pakistan reiterates its commitment to play a facilitation role in good faith. Peace and stability in Afghanistan remain a shared responsibility. He added that Ambassador Zalmay Khalilzad, the US Special Representative for Peace and Reconciliation in Afghanistan met the Prime Minister, Foreign Minister and Foreign Secretary. The Foreign Minster underscored Pakistan’s steadfast support for a negotiated settlement in Afghanistan. Foreign Minister Makhdoom Shah Mahmood Qureshi also met the National Security Advisor to the Prime Minister of Japan, Mr. KentaroSonoura. While welcoming Mr. KentaroSonoura, the Foreign Minister said that Pakistan regards Japan as friend and an economic partner. He added that the National Security Advisor expressed his earnest desire to further strengthen bilateral relations between Pakistan and Japan in the days to come. Foreign Minister reiterated that the Government was focusing on socio-economic uplift of the people of Pakistan and furthering regional peace and stability. While briefing the Japanese side on CPEC, an economic undertaking between China and Pakistan, he invited Japanese investment in Special Economic Zones (SEZs) and assured facilitation to Japanese investors. He added that Foreign Minister Shah Mahmood Qureshi, in a ceremony held at the Ministry of Foreign Affairs, distributed books, school bags, stationary and items of winter clothing among 200 Afghan refugee children as part of the Pakistan-China- Afghanistan collaborative efforts. Addressing the ceremony, Foreign Minister Qureshi highlighted the hospitality extended by the people of Pakistan to their Afghan brothers and sister during the last four decades. At any given point during these years, on average over three million Afghans have been living in Pakistan. He stated that Pakistan had ensured education facilities to the Afghan refugees similar to its own citizens. Pakistan will continue to invest in the education of the refugee children as it is a real investment for a prosperous future of Afghanistan. He also underscored the importance of trilateral cooperation between Pakistan-China-Afghanistan for peace in Afghanistan and the region, deepening connectivity, mutual development and economic prosperity. He added that on this occasion, Ambassador of China Yao Jing appreciated Pakistan’s continued hospitality to millions of Afghan refugees and expressed his country’s desire to work for expanding trilateral cooperation in areas of mutual interests. The Afghan C.d’A thanked Pakistan for hosting Afghan refugees for almost four decades and stated that the trilateral cooperation will contribute towards peace and stability in Afghanistan. Besides his engagements with diplomatic corps, FM Qureshi also met the President & CEO, Telenor Group Sigve Brekke. Mr. Brekke briefed the Foreign Minister regarding Telenor Group’s investment in Pakistan and its popular products like Easy Paisa and Khushal Zamindar. Deliberating on Telenor’s future investment plans, he said that technology was being used to provide financial platform to the consumers at their fingertips. The Foreign Minister appreciated Telenor’s US$ 3.5 billion investment in Pakistan and its innovative approach in providing diverse services to its customer base. Now some updates from Indian occupied Jammu and Kashmir, where relentless and unabated Indian atrocities, violence and savagery continue. He added that we strongly condemn the illegal detention of APHC Chairman Syed Ali Gilani, Mirwaiz Umar Farooq, and Mohammad Yasin Malik. We also condemn the shifting of illegally detained Hurriyat leaders and activists from Indian occupied Jammu and Kashmir to Indian Jails. The deteriorating health of senior Hurriyat leaders, including Shabbir Ahmad Shah, Massarat Alam Bhatt, Syeda Aasiya Andrabi, Nahida Nasreen, Fahmida Sofi, Nayeem Ahmad Khan, Mohammad Aiyaz Akbar, Altaf Ahmad Shah, Peer Saifullah, Mehrajudin Kalwal, Farooq Ahmad Dar, Ghulam Muhammad Khan Sopori, Maulana SarjanBarkati, Shabbir Ahmad Dar, Mushtaq-ul-Islam, Qazi Yasir Ahmad, Nisar Ahmad Rather and hundreds of other leaders and activists languishing in notorious Indian Tihar Jail in New Delhi and other different jails and interrogations centres in occupied Kashmir is also a matter of concern for us. Additionally, in November this year, the Indian occupation forces during so-called cordon and search operations killed twenty four (24) Kashmiris, both men &women including Azad Ahmad Malik, Unas Shafi Bhat, Basit Ahmad Mir, Atif Nazar, Firdous Ahmad, Shahid Ahmad, Umar Majid Ganje, Waseem Ahmad Wagay, Mushtaq Ahmad Mir, Abbas Ahmad Bhat, Khalid Farooq Malik, Waseem Ahmad, Ajaz Ahmad Makroo, Waris Ahmad Malik, Shakir Hassan Dar, Naveed Jatt, Mehraj-ud-Din Khan, Adnan Ahmad Lone (B.Tech student), Adil Bilal Bhat, Ishfaq Ahmad Ganaie, (28-year-old), Muskaan Jan (14-year-old girl ), Noman Ashraf (16-year-old) and Raja Begum (80-year -old) in Shopian, Kulgam, Pulwam and Budgam districts of the Indian occupied Jammu & Kashmir. He added that India should stop misleading the international community and accept ground realities and aspirations of the people of Kashmir instead of continuing with its policy of brutal obduracy in the territory. Foreign Ministry spokesman said in response to a question that Pakistan has consistently maintained that the solution to the war in Afghanistan lies in a negotiated settlement. It is heartening to know that the US is finally realizing the same. I cannot share the details with you at this moment. Ambassador Zalmay Khalilzad was in Pakistan for discussions. There is also activity in Qatar. We also remain engaged with the Afghan Government regarding the peace process. The point that has to be registered is that all the stakeholders involved in the Afghan peace process are now in agreement with our considered position that the solution to the Afghan conflict rests in dialogue through an Afghan-led and Afghan-owned process. Foreign Ministry spokesman said in response to a question that we have been repeatedly saying that Pakistan has its limitations regarding Taliban. However, we continue to make all possible efforts in this regard. I would again emphasize that the point to be registered is that all stakeholders now agree with Pakistan’s position that the final settlement of the Afghan conflict can only be achieved through dialogue. Foreign Ministry spokesman said in response to a question that the Government of Pakistan has strongly condemned the unfortunate incident of attack on Chinese Consulate in Karachi which was successfully foiled by the law enforcement officials, two of whom embraced martyrdom during the incident. Immediate outpouring of sympathy and good wishes for the martyrs from Chinese leadership and people underscores the unbreakable bonds of friendship and trust between Pakistan and China. The Government of Pakistan has taken additional security measures to further beef up the security of the Chinese diplomatic Missions, nationals and interests in Pakistan. We are fully committed to ensure foolproof security of Chinese nationals living in Pakistan as well as all other foreign resident Missions in the country. All necessary measures have been taken to ensure security of foreign resident Missions in Pakistan. Foreign Ministry spokesman said in response to a question that I have already commented on President Trump’s letter. Foreign Ministry spokesman said in response to a question that the Chinese Ministry of Foreign Affairs has informed our Mission, that the map shown by CGTN portrays Jammu and Kashmir as a disputed territory and is therefore shown in white, while the maps of Pakistan and India are brown. This map is in accordance with the approved maps used by the Chinese government and the United Nations. They further said that ‘their position on Jammu and Kashmir and maps has never changed’. Foreign Ministry spokesman said in response to a question that as reported in the media, reforms in Gilgit-Baltistan are on the agenda for the Cabinet Meeting today. Yesterday, the Governor Gilgit-Baltistan met the Foreign Minister. You must have seen the Press Release issued by this Ministry. I would not be able to say much beyond what has already been said. However, I can assure you that all steps that are being taken, and will be taken in the future, are aimed at empowerment of the people of Gilgit-Baltistan. There will be good news for the people of Gilgit-Baltistan. We want to empower them and strengthen their role. Regarding your third question, opening of Kartarpur Corridor was announced by the Prime Minister. We can only move forward if India remains steadfast. India’s reluctance in reciprocating to Pakistan’s proposal is the biggest hurdle in normalization of relations between the two countries. As you all know, the Prime Minister in his letter to Prime Minister Modi outlined a comprehensive way forward for resolving all outstanding issues between both countries, including the Jammu and Kashmir dispute, Sir Creek, Siachen, people to people contacts, trade and religious tourism. Regrettably, as you all know India agreed to our proposal one day, only to renege on their commitment the next day. There is lack of clarity and will, on the Indian side. They have their domestic elections round the corner which have overtaken their policy. It is India that has to agree to work on the proposals that you just mentioned and to a comprehensive dialogue, in general. No other country is involved in this. Foreign Ministry spokesman said in response to a question that the Kartarpur Corridor is Pakistan’s initiative. The US has also issued a press statement terming it as a welcome initiative. Foreign Ministry spokesman said in response to a question that Pakistan atleast has not inaugurated the Kartarpur Corridor just to take credit. This was the genuine demands of the Sikh community that was met. As I told you earlier that Kartarpur is not an isolated event. We wrote a letter to India offering dialogue to resolve all disputed issues in September 2018. Foreign Ministry spokesman said in response to a question that All appointments will be filled in a timely manner. Foreign Ministry spokesman said in response to a question that Prime Minister’s letter addressed to the Indian Prime Minister mentioned forward movement on people to people contacts, among other issues. Details would have to be finalized. Pakistan desires a peaceful neighborhood. Once India is ready to come to the dialogue table, these issues can be discussed.